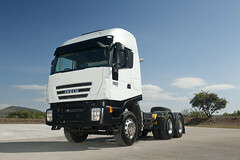 One of the key strengths of all Iveco vehicles has always been the reliability and robustness of their frames. Stralis frames consist of double-bottleneck, C-section rails made of high-yield-strength steel, and are available in gauges of 6.7 mm and 7.7 mm according to wheelbase and model/version. The parabolic suspension is lightweight and offers excellent ride comfort in both laden and unladen conditions. The air suspension is equipped with ECAS (Electronically Controlled Air Suspension) for keeping the height of the frame constant in transit and during loading and unloading operations. With ECAS, you can adjust frame height, to adjust, for example, the loading height to ramps, or when coupling or uncoupling semi-trailers or swap bodies. Ensures the utmost driver comfort and constant chassis geometry regardless of speed, load and road type. Also acts on the braking pressure, which is delivered in proportion to the load on the axles.